A roof coating system presents a great option for reducing costs, restoring roofs, and decreasing a building’s impact on the environment. There are many things to consider when deciding whether or not a roof coating system is what you may need. While it may not fix every roofing problem you may encounter, there are many benefits to this unique system. A roof coating system is a much more cost-efficient option when looking to restore an existing roof. The installation is less labor intensive than a roof replacement as the coating is applied directly on top of your existing roof. Also, a roof coating is less disruptive to everyday business as noise is minimal and odor is low. Many coatings, especially white roof coatings, are highly reflective. They work to decrease the temperature on your roof and therefore reduce the load placed on your HVAC system. This results in lower energy costs and increases the working life of your HVAC equipment. A moderately-aged roof can be repaired and restored with a roof coating system. Even roofs with some leaking can be patched before coating and restored. With prep work, a roof’s life can be extended anywhere from 5 to 15 years. It is also extended because coatings are highly-reflective and protect the roof from harmful UV rays. With the installation of a roof coating system re-roofing debris is kept out of landfills, as the insulation and membrane do not need to be torn off. Roofing projects have been estimated to generate nearly 40 percent of construction waste that ends up in landfills. With the elimination of debris, you also eliminate any landfill fees you might have acquired. Coatings are best done between spring and fall. 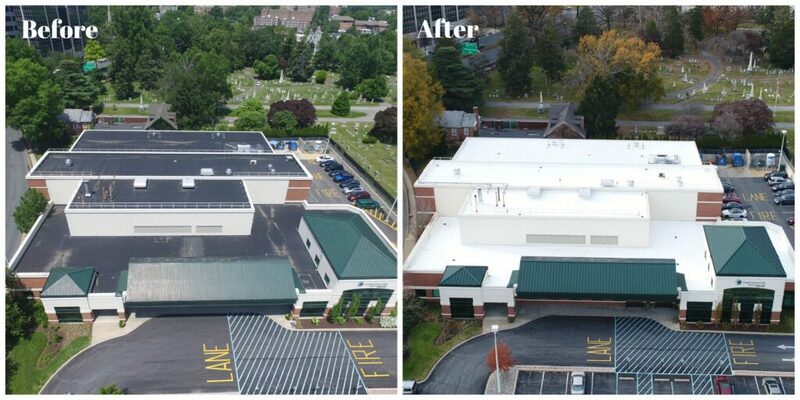 At GSM Roofing we were happy to see how the many benefits of a roof coating system could help our customer, Christiana Health Care System. Due to the sensitivity of the surgery center, re-roofing was not an option. With a roof coating, we were able to work during regular business hours due to its odorless quality. We eliminated the need to send roof debris to the landfill. And their white roof is working to reduce the heat island effect in the city of Wilmington. If you think roof coating could benefit your building, we’d love to work with you. Whether you are just looking for more information on the benefits of roof coatings or are interested in getting started on restoring your roof and lowering your costs, please do not hesitate to contact us.